Should we be worried about death from the sky? A couple of weeks ago, a 30-foot-long rocky meteor exploded over Indonesia. The force of the explosion is estimated to have been equivalent 3 Hiroshima-type nuclear bombs. Oooo. Scary. Of course, it exploded high, high above Earth and no damage was reported. And such rocks only cross our paths every few years. Even so, the article plays up fears that something bigger and worse could smack into the planet at any given time. A sophisticated network of telescopes would be needed to spot rocks this small before they get close to us. Is it worth the investment? I have no idea, depends on how worried you are, I guess. Read the article at the Telegraph. Read more at Bad Astronomy. 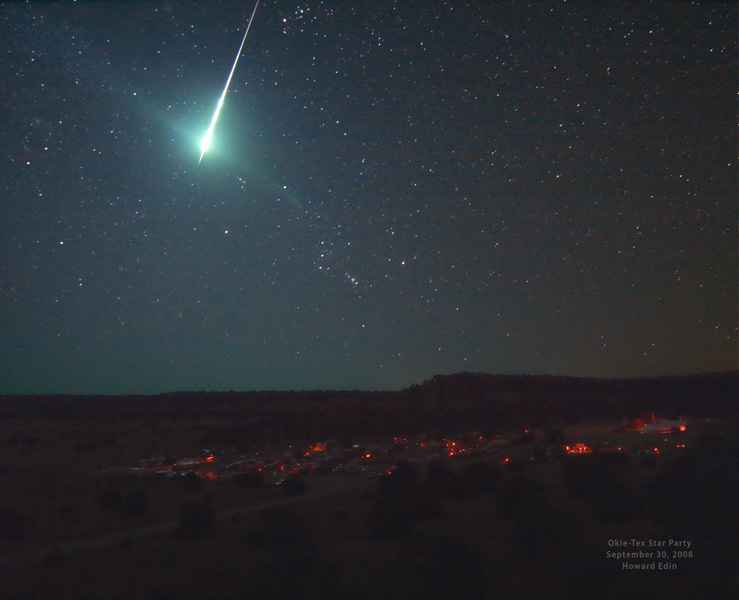 A beautiful fireball meteor lights up the sky over Oklahoma. Are meteor craters the new crop circles? Reports of a meteor impact in Latvia may have been greatly exaggerated. It now looks like the crater was created by someone with a backhoe and some fireworks. We may be seeing the start of a new series of circle-shaped hoaxes in the countryside for fame and cash. Only this time they’ll be loosely based on science instead of alien invasions or ley lines. Read the article at the BBC.